The Lie of Fear: Creating a false sense of fear in order to motivate people to action while easing them past critical thinking. This entry, from the book Shooting The Bull, was the very first items in the “Catalog of Canards”, a list of most common propaganda techniques of the modern era. That organizations favoring gun control too often employ the Lie of Fear is regrettably understandable. 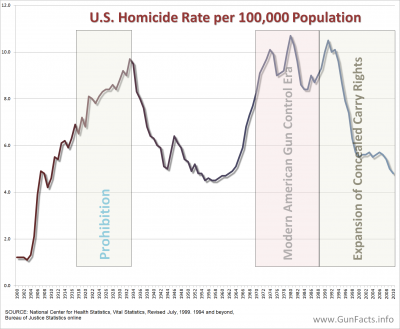 Firearm suicides growing much more slowly than overall suicides. Trace chose to start trend analysis during a low-point in firearm suicides. Depending on the year you examine, firearm suicides constitute about 60-66% of firearm deaths in the United States. 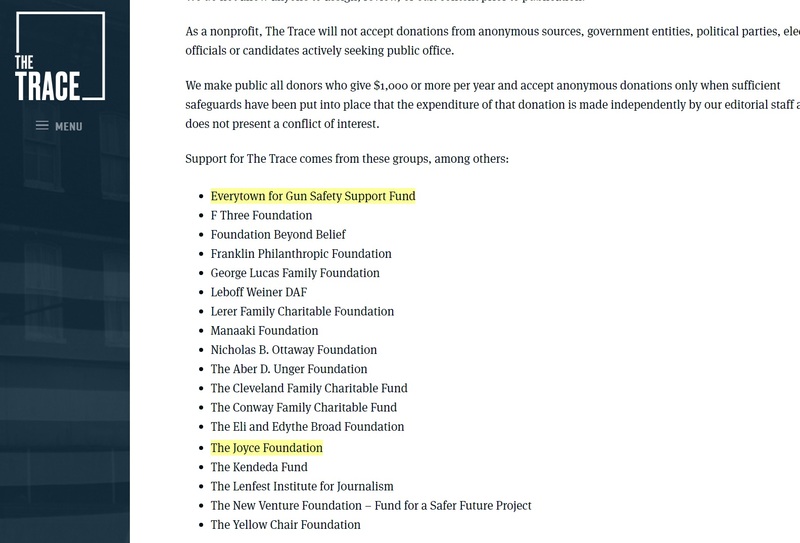 For decades gun control advocacy groups (which, charitably stated, The Trace is one, given the legendary activist donors on their disclosure page and that Michael Bloomberg birthed The Trace) lumped firearm suicides and homicides into the same bucket, in order to broadcast scary sounding numbers, typically with very rigged language (e.g. “There were 33,000 gun deaths last year …”). The problem was that this canard was routinely exposed, so often so, that even overworked journalists – who previously would have echoed the talking point without question – started badgering the gun control groups about the quality of their pitch. In the wake of such exposure, various groups have tried to make firearm suicides a talking point. But they encounter two problems in doing so. First, the Average Joe is smart enough to know that suicide is a mental health issue, not a gun issue. The other is that the Gun Facts Project showed that firearm availability has no bearing on successful suicide attempts. So, in order to generate a little fear, The Trace went ballistic [Editor: Sorry for the pun]. After a decade-long decline, gun deaths are on the rise in the U.S., according to a CDC report. The Centers for Disease Control and Prevention found that there were a combined 72,349 gun deaths in 2015 and 2016 — 27,394 homicides and 44,955 suicides — the highest recorded levels since 2006 and 2007. Especially worrying: Gun suicides increased 21 percent between 2006 and 2016. The goal of the blurb was to make the reader believe that firearm suicides were spiraling out of control. But were they? After all, the Great recession started in 2008 – two years after The Trace anchored their report – and hard economic times often push people into suicidal modes. Also, was 2016 a blip or part of a long-term trend? We at the Gun Facts Project went to the same data source that The Trace used, namely the Centers for Disease Control and their popular WISQARS mortality database. Due to their fractured database, we could grab suicide data from the year 2000 through 2016 in one grab, which thankfully was enough to weed out the Great Recession fluctuation. What we discovered is likely what The Trace wanted to not be discovered. 2006 WAS A LOW POINT: For firearm suicides, the year 2006 was a low point – about 5% below the previous high in 2002. By starting their analysis in 2006, they inflated the appearance of later increases. It is doubtful this was accidental. 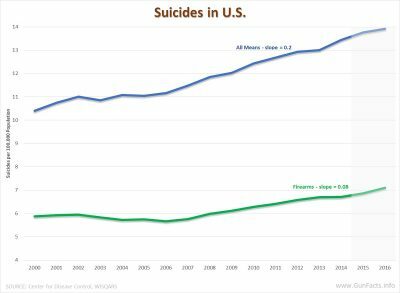 OVERALL SUICIDES ARE WAY UP: The overall suicide rate – regardless of the means used for committing suicides – rose at a swift pace starting around 2007, when headwinds of the looming Great Recession were first being felt. Even if firearm suicide rates rose as steeply as overall suicide rates, that would be a factor concerning psychological depression and mental health, not guns. 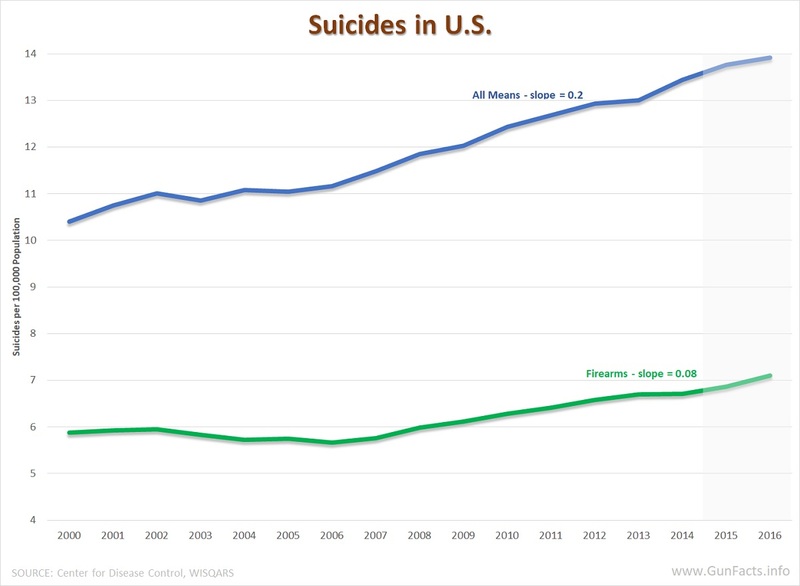 FIREARM SUICIDE RATES FAR LOWER: The big kicker is that the rate of increase in firearm suicides was less than half that of overall suicide rates. Stated differently, of those people who felt a need to “end it all”, more than twice as many chose to do so without guns than with (slopes: 0.2 for overall suicide rates, 0.08 for firearm suicide rates). What The Trace has yet to learn is that all the data is traceable. Spinning tales is not as viable as it once was because the data is available for anyone who wants to have a look (the CDC WISQARS database is online to the public, as it should be). What is effective is their media connections. Let’s be a little blunt. 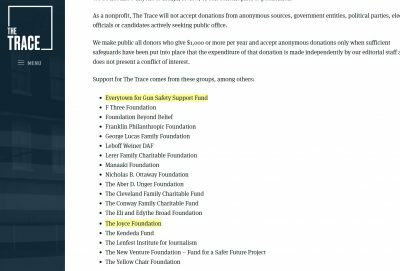 Any organization that knowingly associates or collaborates with The Trace, given its origin and funding, lacks journalistic integrity. 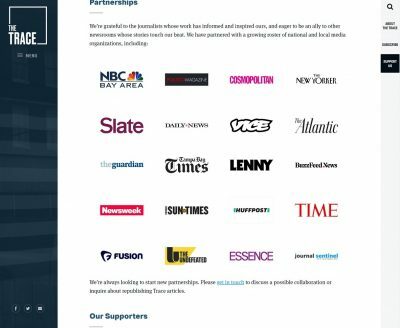 Time, Newsweek, The Atlantic, sundry local papers and NBC affiliates can now be safely recast as agitprop outlets, devoid of the respectability other members of the media strive to maintain. The bulk of them treat everything the SPLC publishes as holy writ, so, as my uncle used to say, that ship has flown.